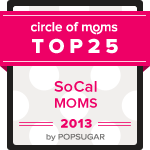 If You Can, Please Vote for RMT as a Top 25 SoCal Mom Blog! One of my newest and nicest interweb connections and resources, Plan-a-Day-Out, told me about this fabulous contest for Southern California mommy bloggers, so I said what the heck and I’ve registered my teeny little blog there. The catch is I need your help to get some votes! Please if you can take a look-see and a few seconds of your day to head over to Circle of Moms and vote for Real Mom Time I’d really appreciate it! You can vote once-daily until WEDNESDAY AUGUST 22, 2012 – so there’s not that much more time, but I still want to take a shot at it anyway! Today (Saturday August 18, 2012) you will find “Real Mom Time (RMT)” listed under the “pending approval” tab and be able to vote even though I just registered today. By Sunday or Monday RMT should be approved and moved onto the “top blogs” tab with all the other registrants.Please help little ol’ me get some exposure to the interwebs. You never know who’s reading, right? Posted in Contest	| Tagged 2012, blogs, Circle of Moms, contest, mom, SoCal, Southern California, top 25 | Comments Off on If You Can, Please Vote for RMT as a Top 25 SoCal Mom Blog!